On September 30th 2015 I visited Ohrid. Elena took us through her town. The three main churches that we visited were the cathedral of Sveta Sofia, the church of Sveta Bogorodiza with the adjacent icon museum and the church of Sveti Jovan Kaneo which is said to be the most photographed church. 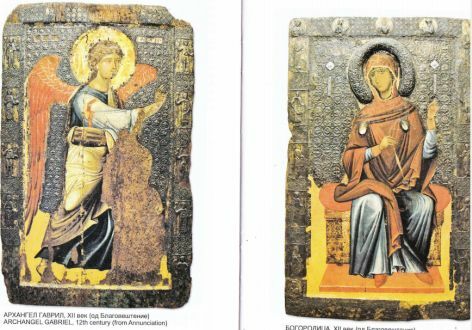 In the churches and in the museum, they sell small booklets with photographs of the icons (Мале туристичке мононрафии ). The booklets are worth buying. I scanned some of the fotos to give an impression of the icons in this blog. “Sofia”” means “wisdom”. 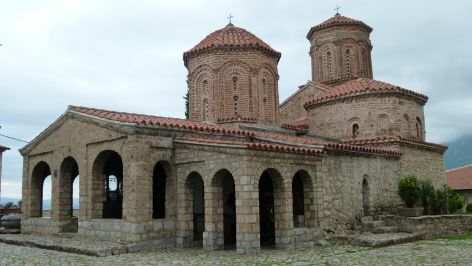 Probably the cathedral Sveta Sofia was already in use in the 10th century – under Zar Samuel from Bulgaria. This is the view from outside. Sveta Sofia must have been decorated shortly before the shisma of 1054 (Orthodox and Catholic). 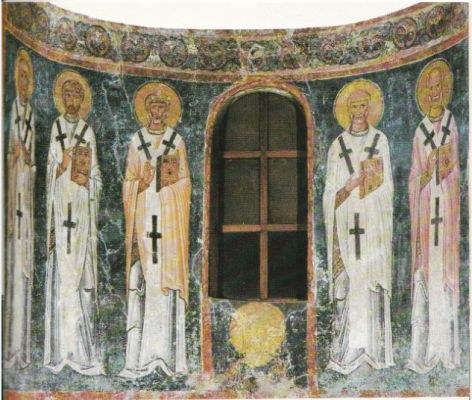 Before the schisma Archbishop Leon (1037-1056) mediated between the orthodox and the catholic directions of belief by having painted not only the orthodox archpriests, but also the popes of Rome. Below are the popes of Rome. Under the Ottomans, the narthex of the cathedral became a mosque and the choir was separated from the mosque. Hidden away in the choir, the 11th century frescoes have been preserved. The wise Godmother dominates the choir. She seems to dream of her son: He stands in an oval shaped cloud (the son does not sit on her arm – so he has not yet been born, but is just a thought). Underneath the Godmother are Christ and the 12 apostles at the Last Supper. The scene looks more like the communion service to me. Our next stop is Sveta Bogorodica Perivlepta. In the Ottoman times, the relics of Sv Kliment were kept here, this is why the church is also known under the name of Sv. 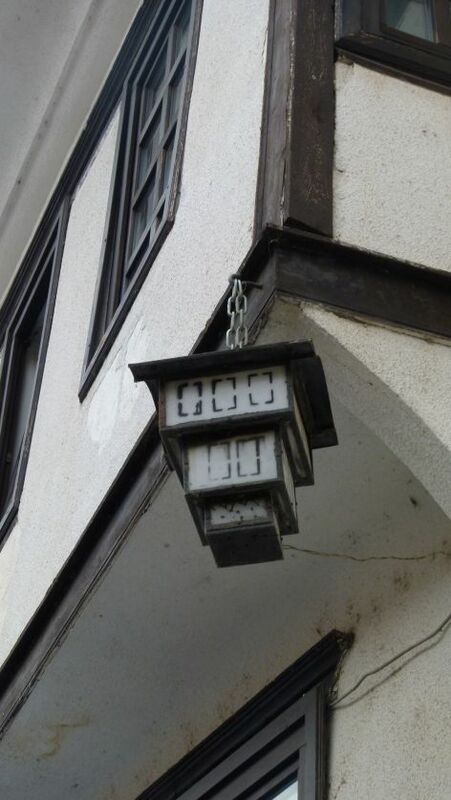 Kliment. Sveta Bogorodiza has remained a church in Ottoman times. This is why the frescoes have been preserved here as well. 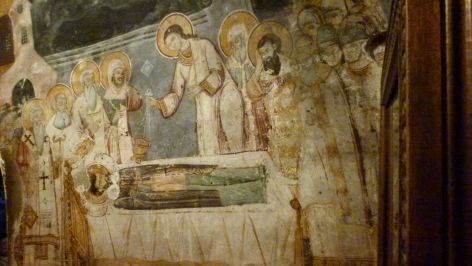 These frescoes from the late 13th century are called “Renaissance”. Overcoming the rigid rules of traditional Byzantine icon painting, the artists brought life and perspective to the scenes. 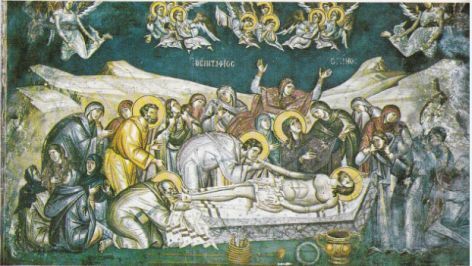 One example is the mourning of Christ – the lady in the background throws up her hands. This early Renaissance movement reminds me of the Brancacci Chapel in Florence that a 100 years later was marked by Masolino’s somewhat rigid fresco about the temptation just across from Massaccio’s vivid representation of the expulsion from the paradise. The representation of the Last Supper shows Christ twice, first handing out bread and second handing out wine… it is like an “infograph” telling a story. 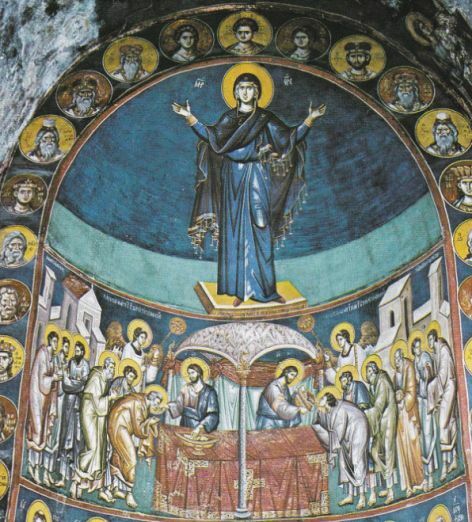 In the church we also find frescoes painted in the Ottoman times (starting around 1450) that follow again more traditional Byzantine rules of icon painting. To round off the overview of the icons, Elena takes me to the icon gallery, just opposite of the Bogorodiza church. 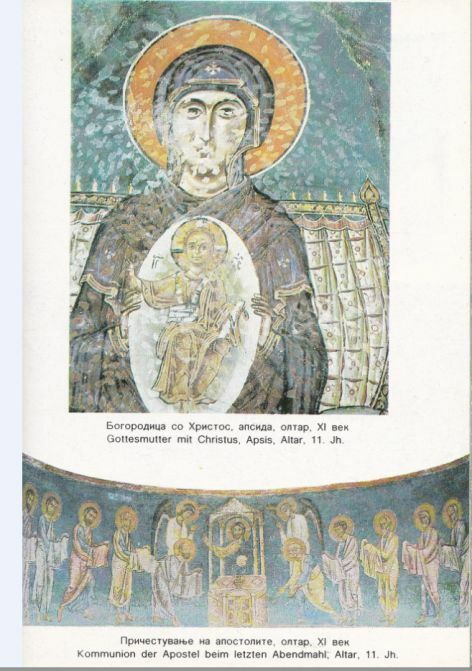 11th century: The icons create distance between humans and saints. The saints look calm and stiff – they are remote holy beings. 12th/beginning of 13th century: The figures become more vivid and more realistic like in this annunciation. End of 13th to 15th century (1261-1453): This period is called Renaissance of the Paleologues and takes place during the second Byzantine reign. Pespective appears in the icons and the saints are represented as human beings. The distance between the saints and the spectators diminishes. This is the evangelist Matthew, painted in the 14th century. 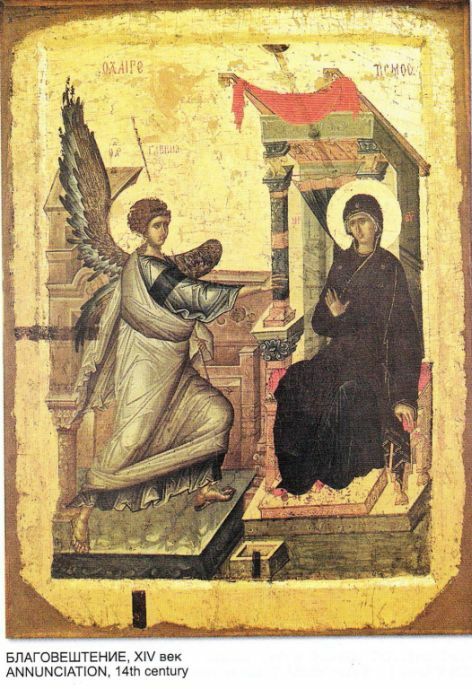 And this is an annunciation also from the 14th century. 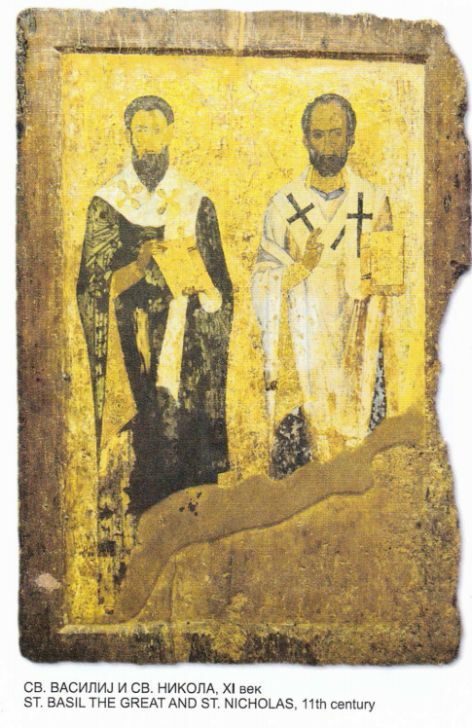 Under Ottoman rule (around 1450 onwards): The saints are again represented in a formal, rigid manner and the icon seems to be “flat”. 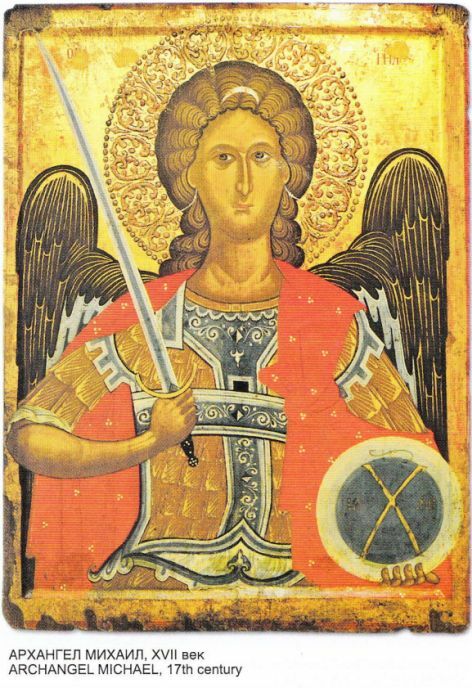 This is Archangel Michael from the 17th century. 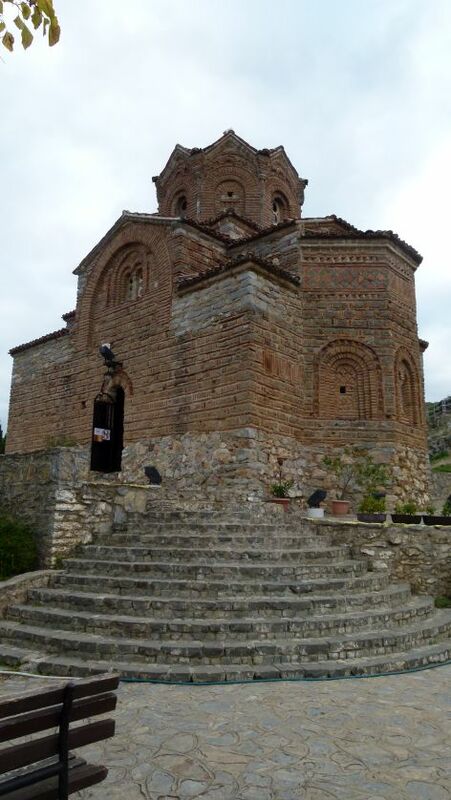 We round off our tour of the three preferred churches in Ohrid with Sveti Jovan Kaneo. 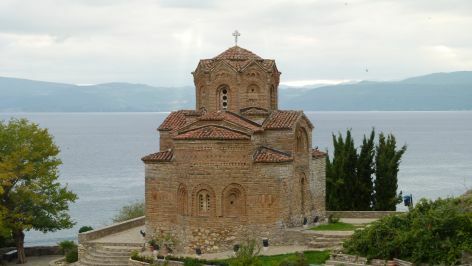 It is probably the most photographed church, and it is usually shown with the Ohrid lake in the background. I also liked the view from below – from here the jagged roof of the central dome can be seen more clearly. 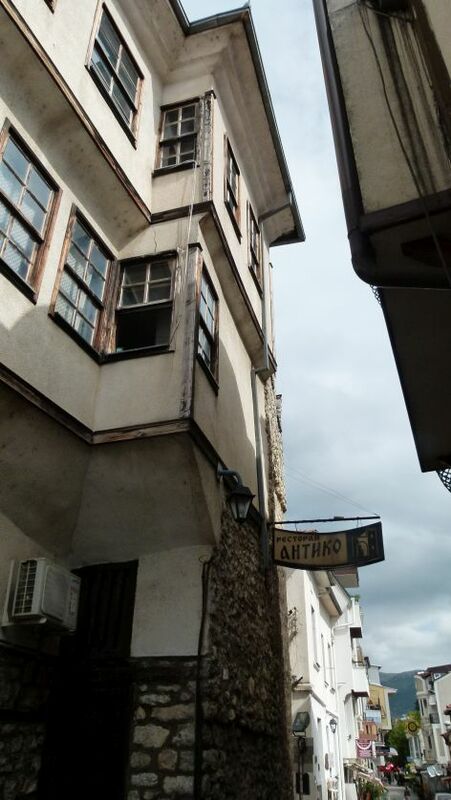 Thank you, Elena, for all these insights into Ohrid and the iconography. Today it is September 30th. 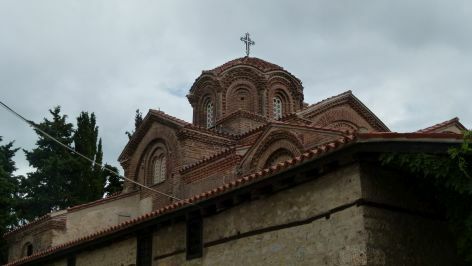 Our plan: Leave Korça and travel to Macedonia to visit the Naum monastery and Ohrid. Then return to Pogradec in Albania. After a tasty breakfast with local specialties we leave the cosy guesthouse Bujtina Leon. 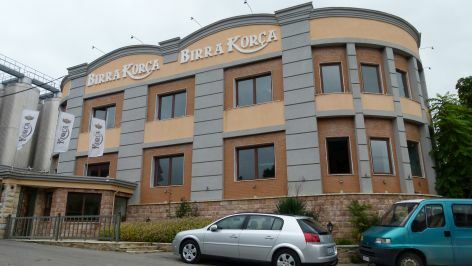 Ben takes me to the brewery of Birra Korça. The Korça beer is available all over Albania. In August, they have a beer festival, similar to the Oktoberfest in Munich. Some 100’000 persons participate in the beer garden next to the brewery. Does Munich know about their little brother? 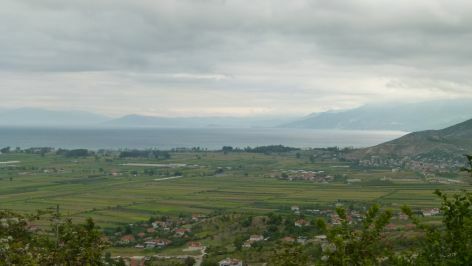 This is our first view of the lake Ohrid, shortly before arriving at Pogradec. 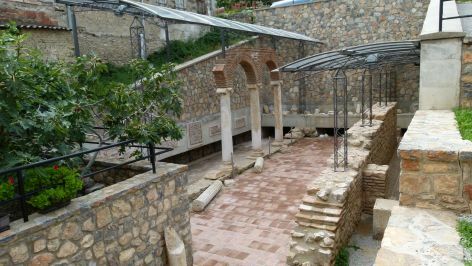 St, Naum and St. Kliment have brought Christianity to this area – in the 9th century. They were the disciples of Cyrill and Methodius. 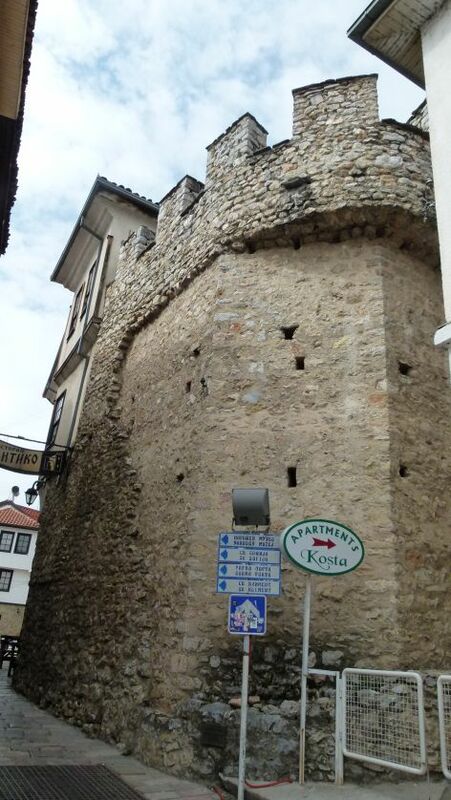 We will meet St. Kliment in Ohrid. Around noon, we arrive in Ohrid. Elena is waiting for us. She is a translator for English, Italian and Spanish and now works as a tour guide. She loves her city and is full of stories. “Ohrid”, she says proudly, “has many, many churches, one for each day of the year.” “Great, and what about the leap year?” I ask. “We will surely find a 366th church”, she answers smiling mildly. It is true, we come across many, many small churches, and we stop extensively at three churches: The cathedral of Sveta Sofia, the church of Sveta Bogorodiza with the adjacent icon museum and the church of Sveti Jovan Kanoa which is said to be the most photographed church. I will talk about these churches in my next blog. While walking Elena stops after every few steps to point out some details that otherwise would remain unnoticed. We enter the city at the lower gate. The streets are narrow. The Turkish houses grow in size from bottom to top. At the bottom, Elena says, space is needed for the traffic in the streets. And higher up, the houses grow in size to efficiently use the space. Sometimes this pattern is even repeated in the lamps. While walking through the streets of Ohrid we find these Roman mosaics that have been uncovered. Entry free. The Greek amphitheatre from the second century BC has a wonderful view of the town and the lake. The theatre was covered in Ottoman times. It has been discovered only recently, Elena says. To excavate it, houses had to be removed. Now the theatre hosts performances. I like the view of the lake and the – mostly – Ottoman houses – no construction sins can be found here (why does the Treschner guidebook complain about the houses hindering the view of the lake? These houses have been here for centuries and before the theatre had been rediscovered…). At various places in town, Elena says: “Here is the theatre”. But the theatre is not “here”, I think. Then again: “Here you can see the theatre.” What does Elena mean? I ask myself. It takes a long time, until I understand: In many churches and houses, columns and stones from the theatre have been reused. 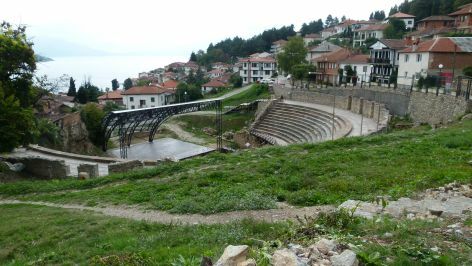 Yes, now I understand, why the theatre is omnipresent in Ohrid. 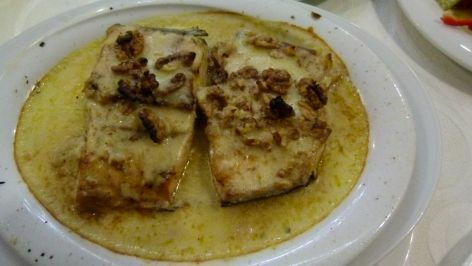 Just across the cathedral Sveta Sofia, we have lunch with regional specialties. To me these Macedonian bites look like mezze. 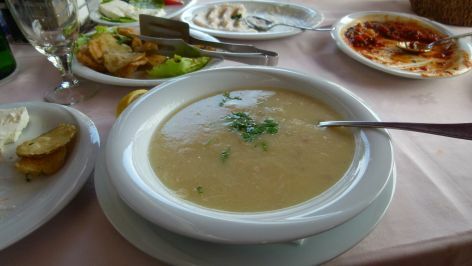 And the fish soup is one of the best fish soups that I have ever eaten – light and with a fresh-sourish taste. We say good-bye to Elena and exchange business cards. Elena was an excellent and knowledgeable guide. 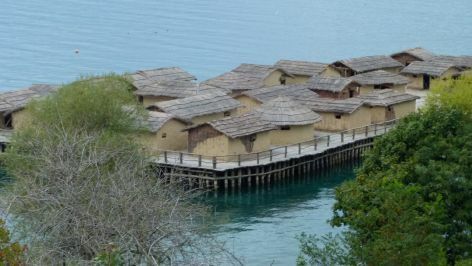 On the way back to Pogradec we come across the stilt houses. Unfortunately the museum closes already at 4PM. We are about an hour late. We cross the border to Albania and settle in the five star hotel Enkelana. Well – five stars is a bit much for the place. But it is an interesting time travel back to communist times. Old communist style hotels and American top hotels like Hilton have one thing in common: They lack atmosphere, even if they are a safe bet – we know what we can expect. Ben smiles and shows me the tiles on the floor. They look like an irregular mosaic and have been there since communist times. I later hear that this style is called “Terrazo“. Ben has eaten in the Enkelana before and recommends to try Koran fish here. Koran is the trout endemic to the Ohrid lake. Ben say that in communist times they have eaten the Koran fish on the Yugoslavian side – now it is the turn for the Albanians to eat it. I feel a little bad, as I suspect that this trout is in danger of extinction. Before the hydropower stations, the eel of the Ohrid lake travelled to the Sargasso Sea in the Carribean and their offspring travelled back to the Ohrid lake. But the dams in the Black Drin have resulted in the eels not to come back to the Ohrid lake any more. I am shocked, how we humans are changing the world. Not only here in the Balkans. We made the same experience in Basel – the salmon came back from the sea, until the dams were built – and they have not yet found their way back using the fish ladders that have recently been installed.